“Good night everyone!…Merry Christmas!” Larry hollered from the curb, as the rest of my guests tiptoed to their frozen cars. The air was soon clouded with humming vapors, and smiling lips sending kisses; funny faces speeding away behind whirling motions on the fogged windows. I followed their snow footsteps to the street, waiving to see them off down the bend. They all quickly vanished taking all sounds with them. I was left with their vivid presence; flickering back and forth to prolong what we shared just a little while ago. It was my turn to hold the after Christmas party; a fun time to give each other gifts. I stood there immersed in my thoughts. Quiet. Peaceful; oblivious that I was outside standing on the sidewalk with the sparkling lights, persuaded that the starlight with a huge moon hanging way over there, was part of a Christmas card, “just like the frilly ones by the mantel” I thought, coming back to reality as I felt a gentle snow drift on my face. Back in the house I spread out my cold hands hovering over the ashes, dragging the wing chair by the hearth, as the snow started to fall again fanning out in bright curtains over the street lights. My cat startled me, as he came up from hiding and jumped on my lap, when I noticed a group of children running across the field, and quickly started rolling up snow into big balls. I couldn’t understand at first what they were doing. They hastily built this tall standing pillar, and when the older boy placed a round ball on top, I mocked them in an unsympathetic tone, wishing perhaps I was there with them “It looks like a silly snowman!”, stirring up my interest a bit. But, it all ended very soon. A woman showed up and called them by name. She was driving a small van, and the kids scampered in and left. I stood up and approached the bay window. After a long great day I was fatigued, as I peeked through the heavy branches gently swinging, hiding for moments the half made snowman. “Unfinished?” I said in a describing question.” If anything, it looks out of place” “It is actually disrupting the wintery look of the field” I murmured feeling uncomfortable of my own comments, and continued “Is this silly me conferring him humanizing attributes by my tired and dull projections?” I thought of my jesting and pompous comment, laughing on my way to the kitchen. “For Pete’s sakes! It’s been a long day” I bantered. Even the anticipation of seeing my guests, had taken its toll on me, but in spite of all that, it was all worth it. But my mind was still outdoors, taken another turn “as long it remains cold, he’ll be there…” I loosely said. “Frosty the snowman; he melted away”, crossed my mind poking fun again to my own folly, and walked back to the chair with an empty cup for a refill. The fire by now was dwindling down; with only a few sparks, tracing like fiery bugs through the ashes, so I pushed in another log. A stream of cold air came down from upstairs when I reached for a cup of coffee and cake to watch the fire come up. I was ready to toddle off about half an hour ago. But inside of me, I was looking for a better excuse to turn in after such a day of preparation and provided entertainment. I knew that once I fall asleep, next day all would be different. I couldn’t stop thinking about the unfinished man. “He had no face, and no arms. He was plopped right there in the middle of the field, and I wondered why? Tomorrow somebody will knock him down, and no one will be able to tell him apart”, I anticipated. I took a sip of coffee, and forgot the cake; something pierced across my mind. Like an urge or a longing, something that I had to deal with. A compulsion maybe, which is very natural in me; akin to put things in a row, in search of order or ultimate perfection (tisk- tisk) Geez! I don’t really know! At that point, I took off my loafers and I went for my snow shoes and coat. I was driven by a desire to go out there, and I knew that I only needed a few things to complete my plan! For sure! “I have enough courage to step out there! I don’t need courage really!” I corrected myself. I want to do it! That’s all!” Briefly I caught a sight of my face on the mirror frame of my uncle’s picture smiling at me. I couldn't define what was moving me, by my own expression. I looked the same. I couldn’t tell, and there was no time to. My cup of coffee sat in there, cold and forgotten, as a reminder of my involvement, just in case I had to back track my decisions; a starting point to explain the event on that night. An intense rendezvous… “Once, at the end of a Christmas party. Nobody would believe me! Not that I need to prove to anyone what I did”, I confirmed. There was nothing that would have dissuaded me from going out to the field. I just knew what I had to do to fashion him right. "It should look like a real snowman should” I said. I quickly collected everything needed for the job. I had to give him a face, eyes and ears…a hat and a cravat for character. I wanted him to have great arms and legs, so I gathered from the tool shed spatulas and trowels, and I pushed my hat over my ears, gloves in hand and all, and I stepped outside. The field was right across from the house. I made certain I had everything needed with me. This time the distance to the field seemed longer; the snow falling prevented me from seeing my way around, and his body kept on disappearing and blending in with the background. By now, there were no traces on the ground of my friend’s footsteps; it was snowing copiously, which made it difficult to spot ‘the man’ from the get go. I headed in that direction by guessing my way. Soon I caught a sight of his silhouette outcropped by the faint street lights from the end of town. Finally when I got there, his back was facing me; I circled him around to best decide what I would create first. I reached into my bag and I found his eyes, so I started with his face, and then I pushed in his mouth, followed by his ears. 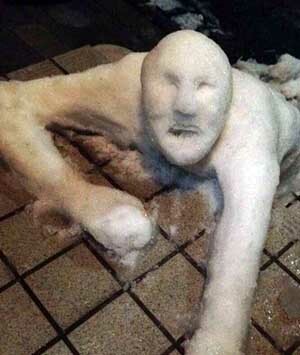 I went down on my knees and collected enough snow for his shoulders, arms and legs. He grew in height and became broader and proportioned. I worked fast, possessing a strong instinctive knowledge of what to do, even when selecting the body parts that I carried in my bag. In a painstaking transition I came to realize that I've finished my task. I lost all sense of time; I couldn’t tell how long it took to complete all of him. I had nothing left to do. I pondered there almost in disbelieve, that I alone shaped with my bare hands this 'creation' that stood with an intelligent stance of his own. So much so, that the thought that he could walk towards me...briefly it crossed my mind. Although I’ve finished him, I sensed immediately that we were two separate entities; as if I had no part in his making or appearance. But it was a stormy night; it was windy, and I was alone standing in front of this bulky snowman, susceptible to my own excitement and my projections which brought about a palpable cohesion in dealing with this sculpture, which a while ago, was just simple snow on the ground. “At any rate! Who in the world builds a snowman in the middle of a stormy night?” I said, coming to my normal senses, and dismissing all of my train of thought. I stepped back to get a better view of my creation. He was done, and he looked flawless; I took off my hat and I placed it right on top of his huge cylindrical head. It seemed too small, and I took it back, only to realize that he was about eight feet tall. I started slowly falling back into my own self; I was all wet and shaking, although my mind was still enthralled by his impressive look. He was daunting by his size and stance; he stood slightly leaning forward with his massive arms pressing against his body. His black eyes revealed a sparkle as the light changed by the flying snow. I felt it was time to go back in the house. I turned around at every other few steps to check on him, and figuring it out, in between, what obsessed me to do this? “Well, I have just done it!” I concluded. The memory of my friends and the warm gathering of that evening were completely drained out off my thoughts; like it never happened. Once I got back to the house I paused at the entryway one more time; the snow falling hadn't abated; it was coming down steady. I walked in and I noticed the fire logs have turned into dead ashes. I was tired and still shivering; my feet were cold. I pulled off my gloves, and I rested my hands on the still warm mantel to unwind a bit. Somehow I didn't want for things to make sense, and I shrugged my shoulders keeping my hands near the heat. “I don't have to tell anyone about what transpired this evening, nobody would care anyway”. I whispered. So I dragged myself upstairs and jumped into a warm shower, and went to bed right away. I closed my eyes, but a carousel of pictures wouldn't stop spinning; I laid there turning my face from the reflecting blinking lights on the high ceiling, which I very much enjoy, doing my best to get some rest, and some shut eye for a few hours. I pushed everything behind me, by reminiscing of my friends, and the lovely evening ending with an impromptu snowman building. Inconceivable? Yes, but it did happen. It doesn't make much sense. Unusual, off the wall... “But I shouldn't have to justify what I have done”, I reasoned “It is Christmas season anyway” I cheered myself . “Happy jolly times!” I slurred, took a deep breath and I fell asleep. Sometime later during the night I awoke by the sound of wind; as if a window popped open. I got out of bed heading to the landing at top of the stairs, and I glanced over the foyer. Somebody or something was at the portico, I could see a shape standing by the beveled glass door, and the side glass lights. It resembled nothing that I knew. By now, I was dumbfounded and fully awaken; I thought for a second, that maybe one of my friends came back, but I dismissed it quickly; they would have called first. I walked down half way the steps, but the blurry glass and the outdoor lights didn’t help. Then I scurried a bit closer. “It looked like it could be a tall person, taller than me,’ I thought. It moved slowly in a rocking motion shifting its weight; this time I was almost certain that he was human. I hesitated first, but I laid my face to the stained glass without even thinking. I was ready for fast action, and I cried out “Who is it?” but I got no answer. I waited for a few seconds and I hollered again “Who are you, and what do you want?” That presence turned around and went waddling down the three steps of the portico and faded away; I watched the distorted shape of that ‘something’ vanishing off, right in front of my eyes. I opened that front door like wanting to rip it off the hinges, and all I found was undisturbed snow; no traces on the landing, or the steps. “I got to go out to the field right now!” I let go with a great deal of effort. “This is a repeat story all over again, but not quite!” It thought, as I bolted out of the house. This time I knew the way, but I ignored as to why I was drawn to the field bare footed into the cold and the snow. I spotted the silhouette of the snowman a hundred yards away; every step became a conscious struggle, my legs turned as heavy as ice buckets, my arms stiffened like rods as I approached him from behind again, and in a state of confusion, and perhaps seeking for help, I called the name that I gave him: “Big Joe!” I whispered it, not expecting what came next. He slowly spanned on the base of his legs and faced me with a silent stare, voicing seconds later in a gargling deep growl “Between you and me!... Big Joe!” and he fell forward, crumbling to my feet. At the same time, and distracting me from my surreal experience, a vehicle stopped by the road side. I recognized it from the night before. It was the same van that brought the kids that started it all. I saw them stepped out of it, and ran across the field in my direction; the taller boy got to me first, waited a few seconds for his siblings to arrive, and very excited he said to them “Somebody used our snow to build a snowman!” Then, in the same breath, he turned around and shouted to the woman in the van “Mom, how do you like him? She lowered the window assenting with a nod and shooting up two thumbs up. They ran back to the waiting van, scampered in and left. With a mild screeching halt, I was back where I was twenty two years ago. It all started at the beginning of a winter season on the east end of the Island. I knew how to get there. Someplace around here there must be still this path leading to the water.